Japanese candy wrapper flies plane into World Trade Center again. 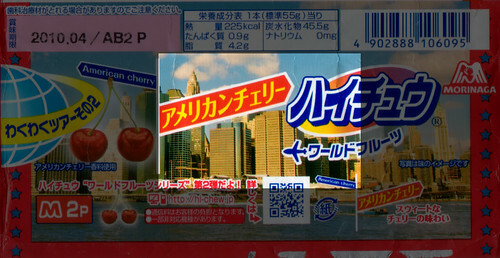 Here’s a wrapper (unfolded) for a pack of Japanese Morinaga-brand “Hi-chew” candy. Looking closer at the center panels, we can see that the backdrop is clearly lower Manhattan, with the Bank of New York at left (and the Woolworth Building in the third panel). Then there’s the strip of text flying by, led by what might be read as a passenger jet on its side, flying past (or into) a building that looks a lot like the Twin Towers of the former WTC. What happened? Total accident, possible sly joke? Who knows? In a world globalized and overflowing with image, there is plenty of graphic collision, and it can be hard to say what means what to whom. 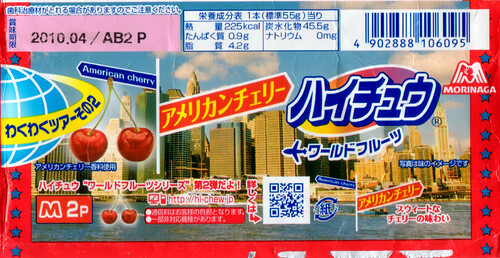 The flavor of this Hi-chew pack, however, is “American Cherry”, which may explain things. I imagine some beleaguered graphic designers, deep in a sub-basement of the headquarters of candy-making behemoth Morinaga Seika Kabushiki-gaisha, needing to come up with a design for the next day, and casting about for something recognizably American, that they could find usable images of easily. I imagine this possibility because New York City is a powerful, global brand — symbol that for many people is almost one with the United States. It is a tremendous asset for New York, except for making the city a prime terrorist target. Many New Yorkers, of course, being rather alienated from the country, might find it strange that foreigners regard the city as synonymous with the nation. Thus perhaps the lower-Manhattan imagery. The plane? Well that’s the plane with the product slogan text trailing behind it that we put on every package design! (I imagine them saying). Here the worlds collide. I buy one of these now and then, I admit, because it has great fun value: seeing the cacaphony of boxes lined up in one package; cracking the outer cellophane to let the different jewel-like, matchbox-sized boxes spill out, each cellophane wrapped as well, and with playing-card markings on back so you could play cards if you collected enough of them. By the time you go through the individual-box cellophane, open the cardboard box, and have one of the tiny intense candies, it is as if you are eating pure colors or images. Yes they are for children, but I like to think it may also help one understand the pleasure Japanese have with packaging. Also I like the candy. Their world and my world, we meet here. This watch is the rolex watches this year, the http://www.web-farm.co.uk hottest watches, Basel Watch Fair launched when the cause of widespread hot. In essence, it http://www.replicawatchess.uk.com and the old section of the steel section Daytona is not much difference, jus http://www.acornpc.co.uk replace the original bezel with ceramic bezel, the other on the nothing changed. But only http://www.mmwatches.co.uk this point, the market reaction is very intense, because the ceramic bezel Although in the Daytona series has been used for many years, but until today, only used in steel section of Daytona. Japanese packaging has no peers, and is such a delight unto itself. I remember being in Tokyo and admiring the care given to wrapping every item, regardless of its value.